I'm thinking of changing my blog to a weather blog seen as i mention the weather in pretty much every single post i do. So as standard...the weather here is abit erratic of late, one day sunny and mild next day freezing and numb. Dressing is a little tricky, i've started to try and ditch my winter coats and stick to jackets and macs. I managed to make it through the winter without having to buy any boots which is a bonus...me and boots dont see eye to eye. The heels i have on here are an early birthday present from my mum. 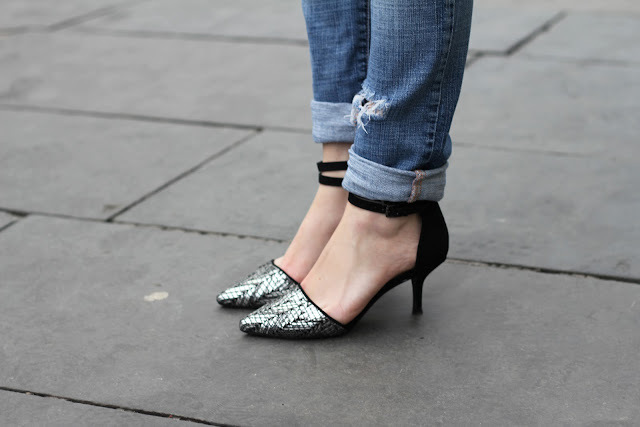 A low heel perfect for shopping with a silver woven pointed front and contrasting black double ankle straps. Zara are killing me with their shoes lately, far too many beautiful summer strappy numbers which is no good for someone trying to save. I paired my new heels with some old blue ripped jeans which i have had since i was 17 , these are my 'miranda' jeans. I will pull these out in 20 years time and hopefully they will still fit! You never fail to impress, and inspire me to wear kitten heels! In love with this combination! Adore it..